Recently, Nolan Harrison caused a stir when he posted that he was returning the trophies that his sons earned for participation in youth sports. Harrison’s point that his sons should earn trophies brings to light the question of ‘participation trophies’. Participation trophies are a common experience in youth recreational sports where every child that is signed up receives a trophy at the end of the season. Essentially, they receive a trophy just for showing up. Some see this as positive reinforcement for our youth; that they should be rewarded for their effort (see SB Nation post – the author makes three good points and then there’s the 4th…). Others however, see this as part of a larger parenting concern with creating a culture of entitlement with our children (see Losing is Good For You op-ed from the New York Times for a sports-related discussion and In Praise of the Ordinary Child piece in Time magazine for a more broad discussion to include education). The Hustle & Attitude philosophy accommodates both sides of this discussion. I disagree with Mr.Harrison when he implies his sons are not entitled to something just because they did their best. I think there is merit to rewarding a child for giving their all in competition; whether they win or lose or make the all star team. However, I agree with Erik Brady of USA Today when he points out that the kids are savvy enough to recognize who the best players are, regardless of whether everyone gets a trophy. My sons have shelves full of trophies from all the youth sports in which they participated. Neither my boys nor my wife and I ever pay them any attention. And more importantly, that’s not why my boys played recreational sports. They played for the fun of competition and the camaraderie with their friends and teammates. The trophies were an after-thought. My coaching style included recognizing the athletes after each game. In every sport, I had a “Hustle & Attitude” award that was given out after each game. 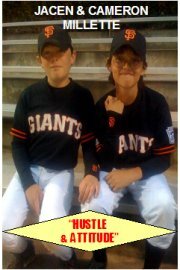 The idea was to recognize the child that best represented the concepts of good hustle or a positive attitude. The award was tied to the sport we were playing. For example, in baseball, I gave out a pack of baseball cards. In addition, we would recognize an offensive and defensive MVP for each game. The MVPs would each get a wristband that they could wear during the next game. After each game, the previous MVPs would give back the wristbands to be awarded again. This is not necessarily an ‘everyone gets a reward’ thing – most of the time, I didn’t keep track who I gave them to – but, it did provide an opportunity to recognize a kid who didn’t always shine. For instance, even though your star pitcher pitched well and the kid that played shortstop and left field played his usual solid game with good plays; you might take the opportunity to name the kid who made a (perhaps surprisingly) great play at their position as the Defensive MVP. Again, as rewards go; the kids know who did well, who the stars are, and who the weaker players are. Coaches (and all the adults involved) have to be genuine with them. You can’t talk up and award the Offensive MVP wristband to the kid that struck out looking in both of his at bats just because you want to lift his spirits or because you think it is his turn for the wristband. The rest of the kids (and parents) will see right through that and you will have lost some measure of credibility with them. Next Post Should My Son Play Youth Tackle Football? I am one who strongly disagrees with partisapation trophies .I think the author is on the right track when you read his last paragraph.